Often users want to restore files that were backed up from a different machine. The following steps demonstrate how to accomplish this task using Syncrify. Files from machine 1 were backed to a Syncrify server. 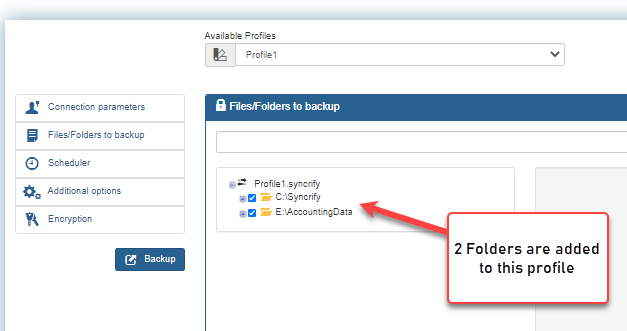 Two folders: C:\temp and C:\data\temp are included in the profile. The objective is to restore two folders that were backed up on machine 1 to machine 2. To make this example more interesting, we will restore the contents of C:\data\temp from machine 1 to F:\data\temp on machine 2. The following table displays the actual paths on both machines. C:\temp and C:\data\temp are called the top-level folders. The simplest way to restore one or more files to any machine is to connect to Syncrify server using a web browser and download files that are required. To download any file, you can either click the right mouse button or simply double click it. This method, however, is not very convenient if you have to restore many files. That is where method two comes in. VERY IMPORTANT: Read this document in its entirety before using this method. 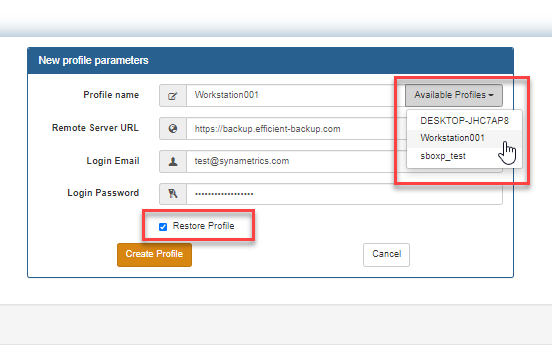 Following steps demonstrate how to restore a backup created on a different machine. First, install Syncrify client on the machine 2. Next you chose the location of the files on the new machine. 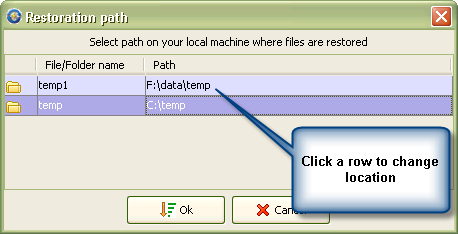 Click Ok if the paths are correct or click the desired cell to change its location. Finally, click the Restore button. It should be noted that after selecting Restore ALL files, it will give a warning to continue. Select Yes. It will then say the existing profile on the client does not match with the server. When asked to overwrite the profile, SELECT NO. Otherwise it will try and create the folder structure to be the same as the original. Using the above example... If you allow the overwrite, C:\data\temp would restore to C:\data\temp. NOT allowing the overwrite would restore C:\data\temp to F:\data\temp It took a couple of try's to figure this out.